Three of the “Big 5” stocks soar… Venezuela crashes default deadline… the Roth leap of faith… and more! Down is up and up is down these days: A majority of Democrats approve of George W. Bush and a majority of Republicans approve of legal marijuana. 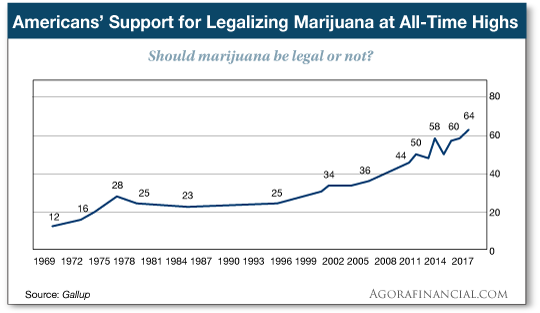 Gallup started asking in 1969… when only 12% of Americans supported legalizing marijuana. That number’s rocketed to 64% today, the highest ever. Those poll numbers align with the reality that eight states and the District of Columbia checked “yes” on a ballot for marijuana. Today, about one in five Americans lives in a state where they can legally indulge. Perhaps the biggest bombshell from Gallup is — for the first time — Republican support for legalizing pot creeped up to 51%. More Republicans now favor legal weed than don’t. That’s up an astonishing 9 percentage points from last year. While over half the GOP supports legal weed, it’s still a federal offense…and that’s enough to scare Canada away from dealing with U.S. cannabusinesses. “Pot companies in Canada just got notice — if you do business in the U.S., you’re going to get delisted,” says our resident expert Ray Blanco. As you might recall, recreational weed becomes legal across Canada next July. But because it’s still illegal under U.S. federal law… the outfit that runs Canada’s two big stock exchanges is taking no chances. TMX Group, the parent company of the Toronto Stock Exchange and TSX Venture Exchange, will be looking into Canadian pot companies to make sure their activities don’t run afoul of Washington, D.C.
“And that means Canadian companies with any exposure to U.S. pot are violating their TSX listing obligations, even if they’re compliant with state laws,” Ray says. So how does this Canadian dust-up affect Ray’s pot stock portfolio? “Ultimately, it means good things for us,” he says. “While many other Canadian pot firms were focusing their attention on grabbing U.S. cannabis opportunities that they now have to unravel, ours were focusing on totally separate markets. [Ed. note: Ray’s research has just turned up a time-sensitive opportunity ahead of full legalization in California on Jan. 1, 2018. According to his vast network of contacts, a select group of heavy hitters is acting right now to seize first-mover advantage on what’s shaping up to be a $7 billion industry. To the markets, where the Nasdaq is tearing it up. Thus the Nasdaq Composite is up 1.5% — in record territory at 6,653. In contrast, the S&P 500 is up half a percent and the Dow is ruler-flat. The big economic number of the morning is the Commerce Department’s first guess at third-quarter GDP. The “expert consensus” was looking for 2.5% annualized growth — a meaningful slowdown from the previous quarter’s 3.1% figure. But the number is 3.0%. Hurricanes? What hurricanes? In merger-and-acquisition news, the drugstore chain CVS is in talks with the health insurer Aetna — supposedly so CVS can have a captive audience for prescriptions. But the news comes at the very moment Amazon is talking about getting into the script biz… so as we write CVS is down nearly 4% and AET is down nearly 3%. Gold has taken another hit, this time thanks to events in Europe. Yesterday the European Central Bank announced it would scale back on its quantitative easing/money printing… while at the same time promising to extend the program till September of next year. As a result, currency traders clobbered the euro and flooded into dollars. A stronger dollar usually translates to weaker gold, and the gold price ground down all day yesterday to nearly $1,260 — a level last seen in early August. This morning gold is rallying a tad, the bid now $1,269 — possibly some “safe haven” buying in reaction to more news from Europe. The parliament in Catalonia has voted to declare independence from Spain, and the Spanish Senate has approved “emergency measures” to impose direct rule from Madrid. Jim Rickards introduced us to this counterintuitive concept early last year. The Federal Reserve printed $3.6 trillion starting in the Panic of 2008, so a shortage seems like the last problem the world would be facing. “How could there possibly be a dollar shortage?” Jim asks rhetorically. “The answer is debt. While the Fed has printed trillions of dollars of money, governments and the private sector have created hundreds of trillions of dollars of new debt. “In other words, for every dollar the Fed printed, borrowers have created $25 of new debt.” says Jim. “As long as the debt is performing or lenders are willing to roll it over for new debt, all is well. But in a liquidity crisis, suddenly borrowers cannot afford to pay and lenders are unwilling to roll over maturing debt. Everybody wants his money back! “Debtors who cannot afford to pay start selling other assets to raise cash. This is how contagion spreads from one market to another and around the world,” Jim forecasts. And that’s what’s showing up in an exotic corner of the markets known as cross-currency swaps, according to a recent Bloomberg article. Without getting too deep into the weeds… global investors who buy U.S. debt are finding it more costly to hedge the risk of swings in the dollar’s value. Something else that bears watching — the debt crunch in Venezuela. “What if Venezuela defaults?” we mused in this space last April. Six months on, the question is much less hypothetical: The state-owned oil company PDVSA has more than $2 billion in bond payments due — one today and another next Thursday. PDVSA took advantage of a 30-day grace period to buy time… but time’s about to run out. Here too, the knock-on effects are hard to predict… but for the moment, market panic is not evident. And now a bizarre twist to the War on Cash: A longtime Chicago politician proposes businesses must accept cash… or pay up. Like it or not, we’ve chronicled how some businesses — usually in urban areas — have gone cashless, often to foil potential robbers. But that doesn’t sit well with Alderman Ed Burke. “Elitist”? 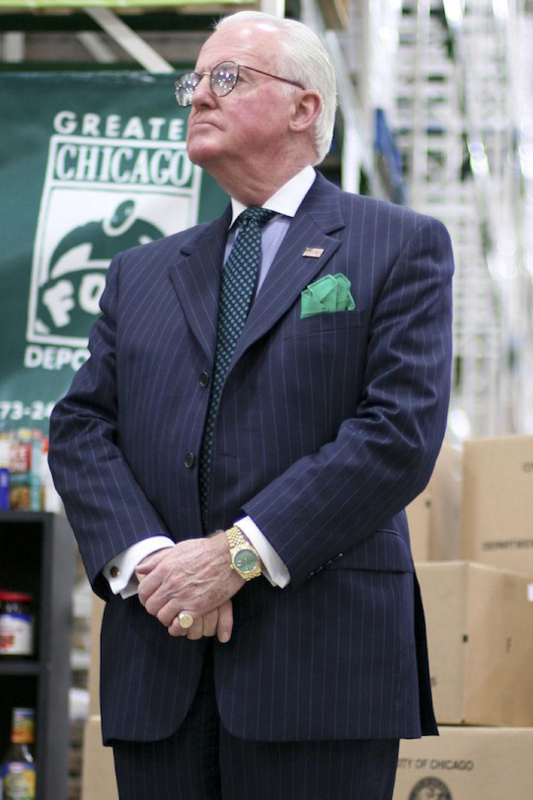 Burke has sat on the Chicago City Council since 1969. His law firm’s clients do business with the city. His wife sits on the Illinois Supreme Court. That’s the Chicago way. “Dave, it seems to me the current Trump/Congress nonsense about tax reform is just theater,” writes one of our regulars. “Nothing will really change (for the better anyway) until our federal government stops its profligate deficit-spending-and-inflating ways. Otherwise, any so-called tax cuts, tax plans or tax reforms amount to little more than rearranging deck chairs. “I don’t expect the situation to improve in my lifetime. I do, however, expect its negative consequences to crack up our economy anytime now. “As for our retirement accounts? I fear the gubment is coming for them, one way or another. 401(k)s will be ‘Rothified.’ Roth IRAs will be ‘401(k)ified.’ Pensions will be underfunded (if they aren’t already). The tax advantages of these accounts were promised by politicians who are long gone now — and the current swamp rats are proving to be more undisciplined and unscrupulous than ever. “They need the revenue and we can’t stop them. So the ‘ice-nine’ scenario Jim Rickards has been warning us about is coming sooner or later. The 5: We said it earlier this month, but we’re compelled to say it again: A Roth IRA strikes us as a leap of faith. Yes, yes, we know the spiel about how a Roth is the way to go if you expect your income in retirement will be roughly the same as it is while you’re working. But that assumes the feds aren’t going to change the rules on you. Long ago we were promised Social Security benefits wouldn’t be subject to income tax and look how that one worked out. Maybe if you’re approaching retirement the leap of faith will pay off. But if you’re still 15 or 20 years away, there are too many bad things that can happen between now and then. Take the tax savings now. The 5: What? And impair our precious military-industrial complex? Sacrilege! P.S. Just a little more than two months now before recreational marijuana becomes legal in California… and some big-money players are jockeying for position. Our Ray Blanco has been talking to all the movers and shakers, figuring out where to best position his premium subscribers. And he’s uncovered a lucrative but time-sensitive opportunity. Get the details right here. Please note: This information will be out of date by the time the weekend is over, so now’s the time to act.